SoftPlanet makes it possible for everyone to get free Windows 8 Transformation Pack download directly from our servers. There is no registration needed for downloading. The software package includes a few different instruments, which will simulate Windows 8 interface. It is a great way to customize your current operating system ( Windows XP, Vista or 7). The software pack is 100% free, so you can download it right away. During the customization process, you can select between three different option for your OS interface, which will make it look very similar to Windows 8 – Charms Bar (powered by Rocket Dock) and two version of Metro Start Screen, powered by WinMetro and Newgen. In addition, you can also modify your system font. Actually, the program offers only three fonts – Segoe UI, Segoe UI Light and Tahoma. Of course, you can keep your default system fort as well. This handy utility offers a pretty simple GUI. All options you have access to are placed within a single screen. There are three drop-down menus, which enables you to select System files transformation, System font configuration and Immersive UI. Besides that there are five more Windows 8 Features option, which allows you to add some extra fine touches to your OS look. Thanks to its simplified graphical user interface, the free software feels very user-friendly and intuitive. Basically, you are able to customize the outfit of you Windows OS within seconds only. Keep in mind that this transformation pack is available for Windows XP, Windows Vista and Windows 7 only. Fortunately, it supports both 32-bit and 64-bit platforms. If you are looking for a free and easy way to bring the look and feel of Windows 8 to your desktop, Windows 8 Transformation Pack 9.0 seems to be a decent choice. Please feel free to post your observations within the Comment section. 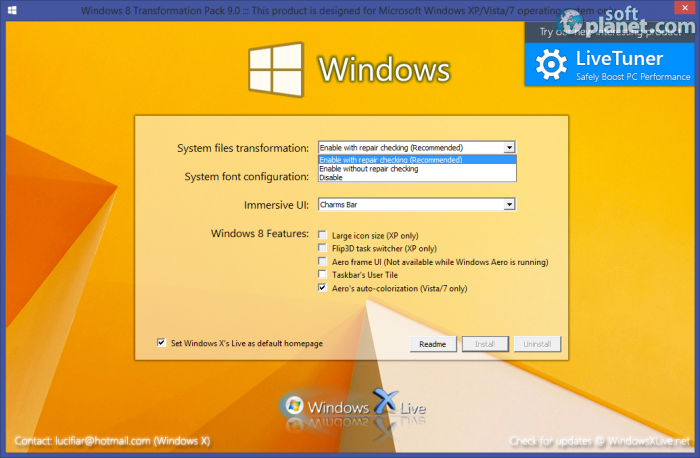 Windows 8 Transformation Pack is VIRUS-FREE! Our security scan shows that Windows 8 Transformation Pack is clean from viruses. The current version of Windows 8 Transformation Pack has been scanned by our system, which contains 46 different anti-virus algorithms. That ensures that Windows 8 Transformation Pack 9.0 is 100% safe for your computer.